On Sunday, December 9, 1934, seven men met to discuss the possibilities of organizing a Benevolent Club (Leichen Verein). It was during the depression, work was scarce and times were hard. One of the many problems facing people during those difficult days was the problem of a respectable burial for their loved ones. When the tragedy of death struck, it brought along with sorrow, the almost impossible financial burden of a funeral. The Welfare Department paid a maximum of $25.00 in funeral expenses to needy families. This, however, was most inadequate for a proper burial. The need to draw the peoples of German origin together, with the hope of assisting each other, at least in this type of emergency, motivated the founding of our Club. The Founders were: Frank Danecker Sr., Joseph Besch, Frank Haidt, Tony Haidt, Nick Seidl, Peter Rieser, and Jacob Slater Sr. These seven men began their program by visiting German families in the district, inviting them to a meeting on Sunday, December 16, 1934. Eighteen men were present at this gathering, the Club was formed, statutes drawn up and adopted, and officers elected. The following men made up the first Board of Directors (or “Committee”): Frank Danecker Sr. (President), Tony Haidt (Vice-President), Fabian Shriner (Secretary), Jacob Slater Sr. (Treasurer), Peter Rieser (Collector), Joseph Bowman, Nick Seidl, Matt Edl Sr., and George Weiss. Each member is bound to pay a tax of $0.50. When a member dies, the society will pay 80% of the income sum. After a funeral each member is bound to pay $0.25 tax within 15 days after a funeral. A member who does not pay the tax within 15 days after a funeral loses the right to be a member of our Club. Our funeral club is one which is not dependent upon other clubs. Each person who is over 6 weeks old can be a member of our club. No distinction is made in regard to religion or nationality. 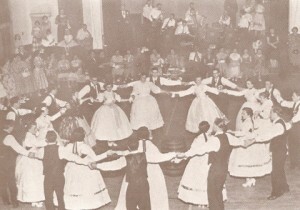 From the Club’s inception in 1934 until early 1940, its functions were limited to funeral assistance, as well as general meetings, committee meetings, and several dances, house parties and family picnics. 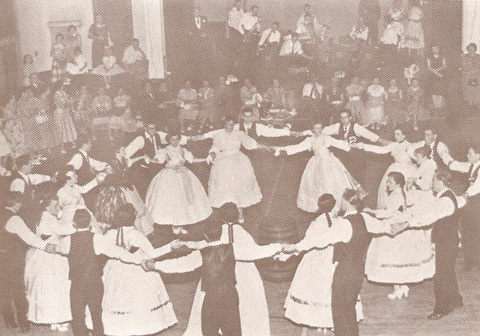 Facilities rented for general membership meetings and dances included Odd fellows Hall, the Hungarian Hall and the Italian Hall. The homes of members were used for the other functions. From 1940 to 1945, the crucial years of World War II, all social functions ceased. Only urgent business matters were conducted by the executive, especially funeral assistance. In 1946 the normal functions of the Club were resumed. Our first Kirchweihfest was held in St. Patrick’s Church Hall in 1949, with almost 700 persons in attendance. This traditional festival was held each year for many decades to come.